With 75 individually named, pull-off-style overlooks along the Skyline Drive within Shenandoah National Park, you might wonder why anyone would trek up and down the mountain sides for miles in order to catch a good view. 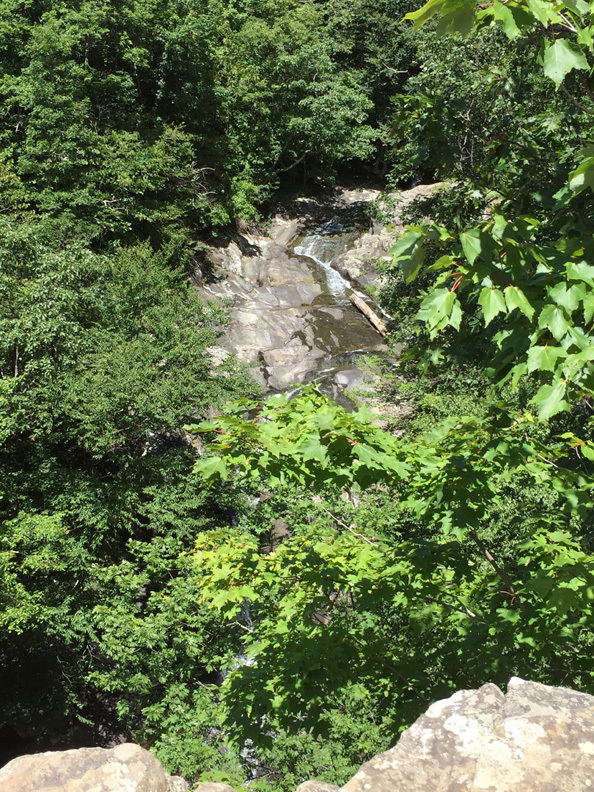 An 86-foot waterfall is reason enough. More than a dozen PATC members from both the Charlottesville and others from the PATC meetup group combined efforts on Saturday, August 5, to hike more than seven miles, first down and then up, for the chance to have a picnic lunch on a giant slab of rock overlooking the upper reaches of Whiteoak Canyon Falls. With hike leader Gabriel Garretson in the lead and Lindsey Brown following as sweep, and 12 other hikers including Anne Colgate, CJ Woodburn, David Crowe, Dennis Templeton, Heather Stewart, Jeanne Siler, Jennifer Dice, John Brandt, Marian Styles, Patrick Cory, Schanna Chilcote, and Susan Lopez headed off from between mileposts 44 & 45 in the Central District of the Park after leaving cars at the Crescent Rock Overlook parking area. 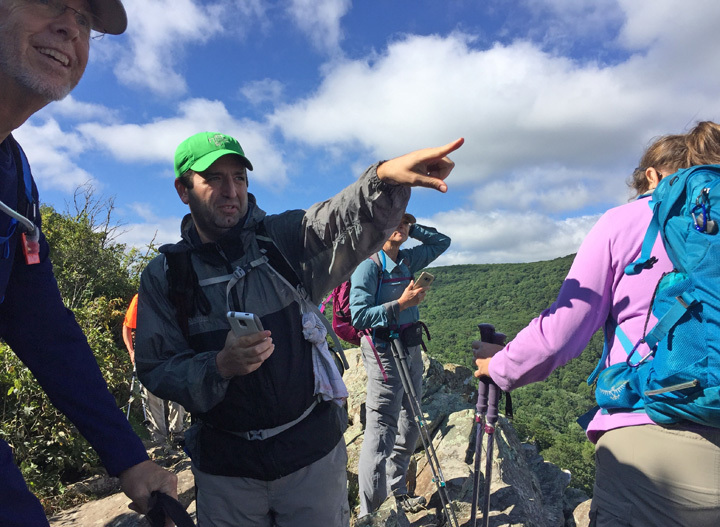 Hikers hailed from as far off as Fredericksburg and northern Virginia to join the group, testimony to the draw of PATC online posts of hiking schedules. 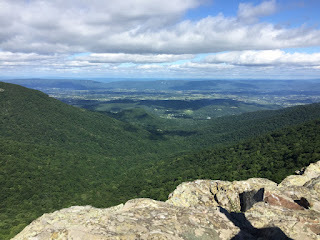 First stop was the under-appreciated Crescent Rock vista, barely minutes from the Crescent Rock parking lot’s southern end, (with no sign) but offering great views of Luray and the Shenandoah Valley to the west. Betty’s Rock trail, advertised as part of the day’s three-view adventure, ended up off limits. 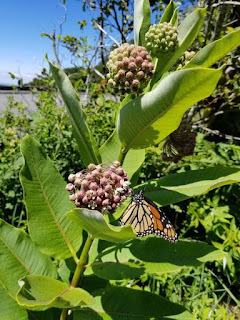 A park ranger encountered just north of the parking lot declared the overgrown 0.7 mile route closed because of the growth of rare plants growing along the trail and near the rock. Rumors were spreading all summer about why such an accessible path from such a little-used parking lot might be restricted (including the possibility that rattlesnakes, hardly an endangered species, were repeatedly spotted in that area.) Our leader, however, shifted gears easily enough and took his hikers ambling gently down the Crescent Rock Trail for a little over a mile before hitting a section of the wide and handicapped-accessible Limberlost Trail. A side trek to check out the almost boggy origins of the Whiteoak Canyon River made up for missing Betty and her rocks. 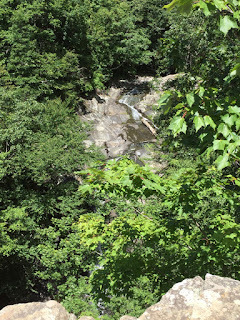 A turnaround onto the Whiteoak Canyon Falls trail kept hikers paralleling the river (as it grew in size and the path narrowed) on the way to our obvious lunch spot with a spectacular perspective of the upper falls, the largest of six significant falls along the popular Whiteoak Canyon Trail. 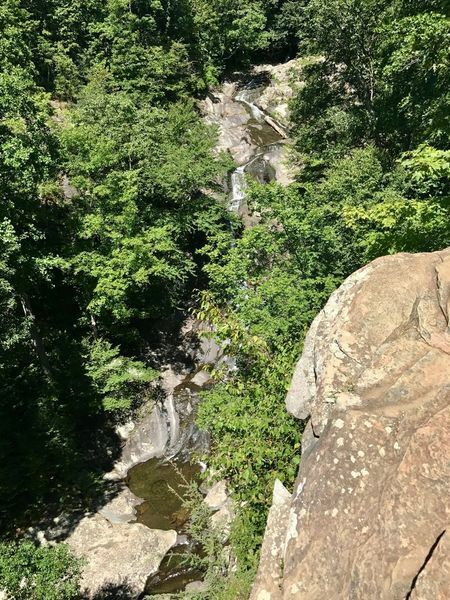 Many hikers are likely familiar with this view, but take a more difficult hike up the Whiteoak Canyon Trail from Route 600, south of Old Rag, rather than the downhill approach from Skyline Drive. 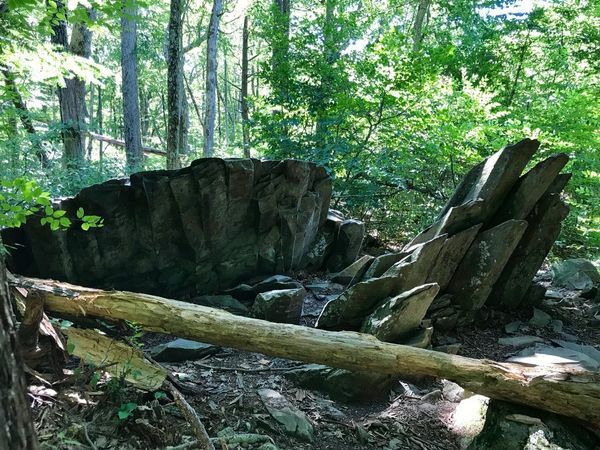 It was the kind of low-humidity Saturday, a true oddity for any day in August, that pulled hundreds of visitors away from their homes and toward the parks’ trails, making for especially dense lines of cars near the trailheads for Dark Hollow Falls, South River Falls and Lewis Falls. The cool breezes meant a couple potential swimming holes went unused, but made for smiling faces even as the group climbed the 1300 feet of elevation back to the cars. 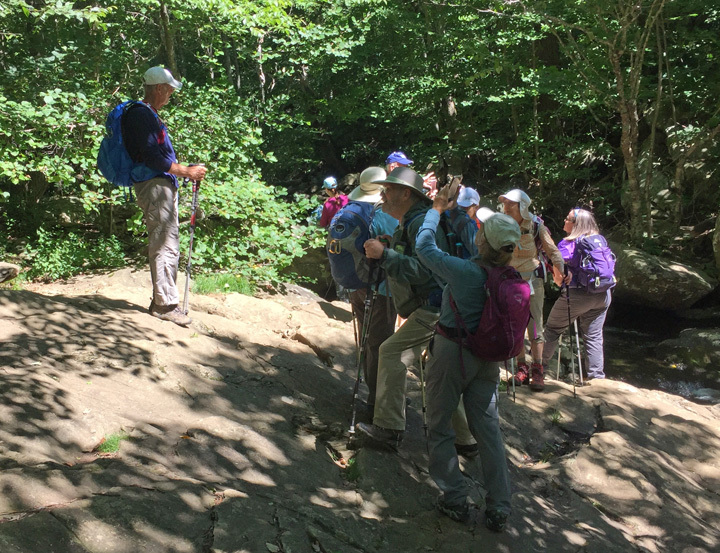 On a very hot and humid summer day, 12 hikers from the Charlottesville PATC and the PATC meetup group went on an exceptional summer water hike in Southern Section of Shenandoah National Park. 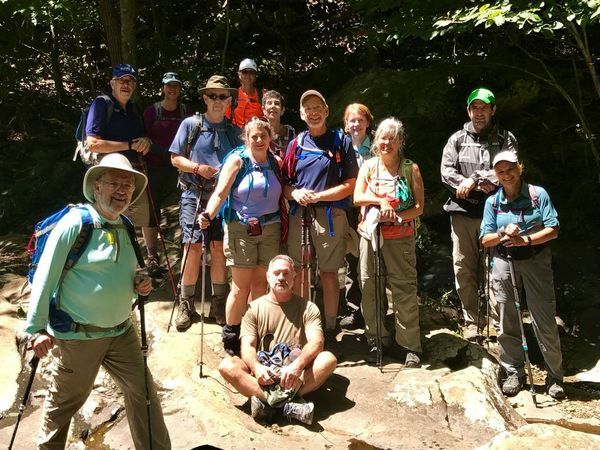 Hikers included Gabriel Garretson, Steve Braintwain, Susan Lopez, Sandy DiCarlo, Marley McGrath, Patrick Cory, Norman Beil, John Brandt, Bev & Pete Fink, Dane Alder and C Hardy. 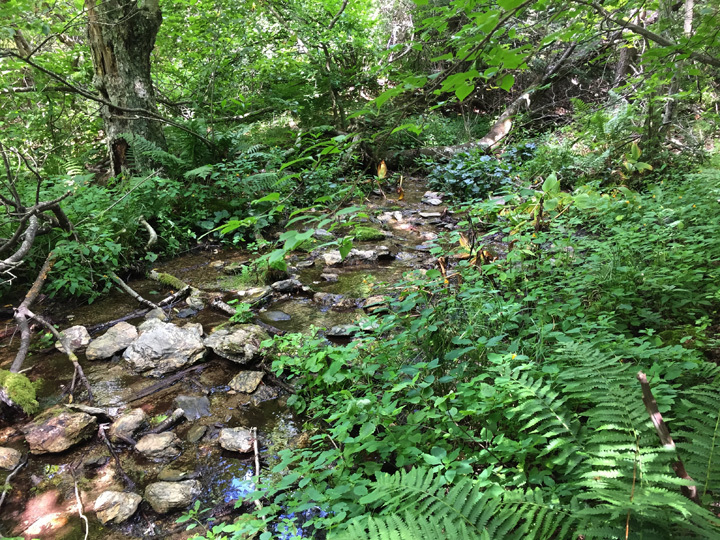 About 5 miles of the hike was adjacent to beautiful mountain streams in the remote parts of the SNP wilderness area. 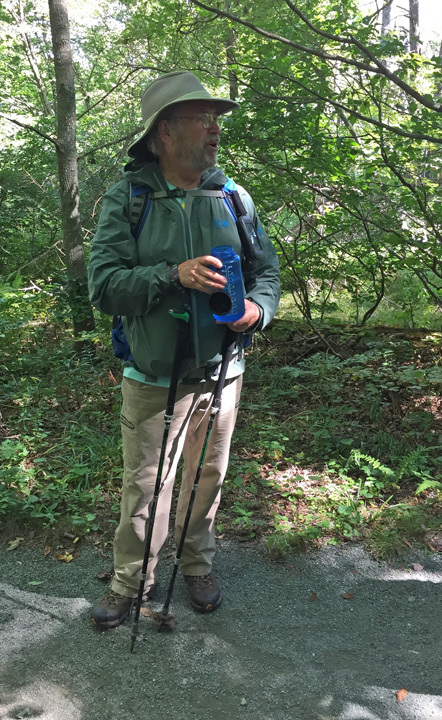 After we setup shuttle, we began the hike at the Brown Mtn Overlook at MP 76.9 and descended on the Brown Mtn trail. Next we connected with the Rocky Mtn Run trail and descended until we reached the Big Run Portal trail. After lunch and splashdown, we began a gradual climb up the Big Run Portal trail to the steeper Big Run Loop trail and climbed up to Big Run Overlook. 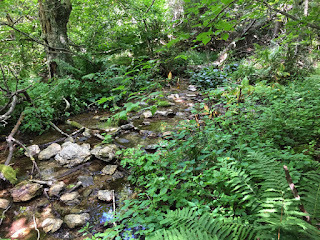 Overall this hike included 7 plus stream crossings, which everyone was able to cross without getting wet. The hike leader overheated and was the last to arrive at Big Run Overlook but was very blessed with terrific support from other hikers that waited patiently and enjoyed extra time to visit.